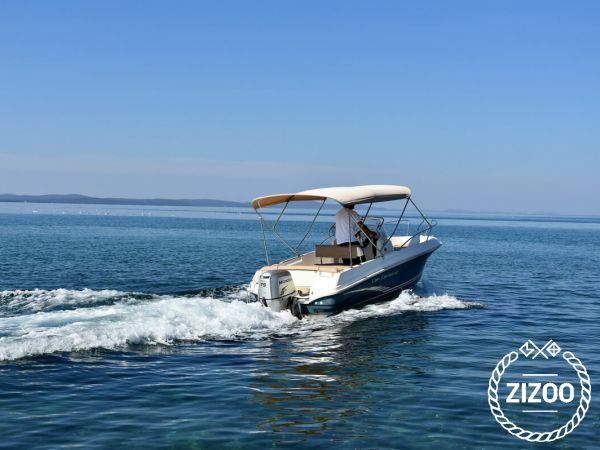 Cap Camarat 5.1 is a perfect day boat that can take you, your family and friends to the best destinations in Zadar region. With an outboard engine Honda 75BF it is both; fast and fuel efficient, as well as fun to drive. Endowed with a strong, pronounced V-shaped bow, her shapely semi-planing hull offers speeds adapted to the most popular recreational activities aboard this style of boat: waterskiing, fishing, touring, cruising and gliding. Security onboard the Cap Camarat 5.1 CC is a key strength, particularly for families with young children. She offers exceptional stability, numerous handrails and high sideboards. The spacious cockpit is well protected by a stainless steel balcony railing, while the leaning post bench seating and central console contribute to the overall comfort. The boat is located in Jazine harbour, very close to the old town of Zadar. Whereas you are with friends or with your family, it is the perfect boat to spend a great time for your holidays. If you are interested in renting my boat, please feel free to contact me via Zizoo messaging.